Globe amaranth, Gomphrena globosa, is a tropical annual native to Central America from Guatemala to Panama. The persistent, 1½-2″ long, clover-like blossoms are borne on upright spikes from summer through frost. The individual flowers are inconspicuous, but the stiff, papery bracts that form the bulk of the structure are colorful and showy. Various cultivars come in shades of pink, purple, and white. Selections of or hybrids with G. haageana (a tender perennial native to Texas, New Mexico, and northeastern Mexico) introduce red and orange shades. Red globe amaranth growing with blue flowers. Gomphrena grows one to two feet tall and about a foot wide with stiff, erect branched stems. The opposite leaves are long and slender. They start out wooly-white when young, but lose this characteristic as they age but remain hairy. 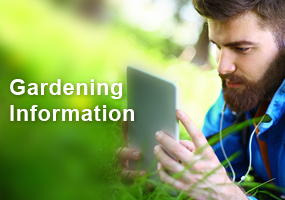 The hairy foliage easily collects dirt, so mulch around the plants if you want a clean look. G. haageana especially tends to sprawl when growing alone. Taller plants can be staked, but its open branches mesh nicely with other loose, informal flowers. This annual does best in full sun and prefers moist soil, but tolerates dry conditions once established. It will not thrive until warm weather arrives. It is easy to grow from seed or can be purchased as transplants – or sometimes you will get self-sown seedlings (but the color of these may vary from that of the parents). Seeds and seedlings of Gomphrena globosa. 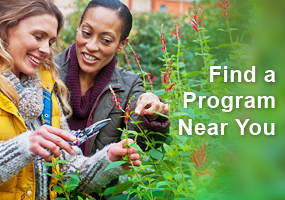 Sow seeds indoors 6-8 weeks before last frost. Soaking the seeds for a day or two before planting will speed germination. Plant outside (after hardening off) about 8″ apart after all danger of frost has passed. 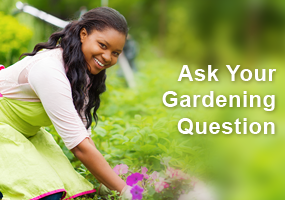 Pinch out the first flowers to encourage a bushier plant with more flowers or let them grow for a more open look. They will bloom much better if regularly cut. 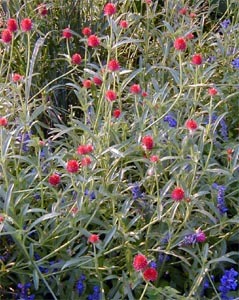 Gomphrena combines well with many other annuals in informal plantings. They are typically planted at the front of the border. The purple cultivars contrast nicely with yellow flowers like lantana, Melampodium and shorter marigolds. Pink or rose cultivars are set off by dark-leaved plants such as burgundy-leafed coleus or ‘Blackie’ sweet potato vine. I alternate rose-colored gomphrena and ‘Queen Victoria’ blue annual salvia behind white alyssum or Nierembergia in a narrow planter bed fronting a rock wall for good effect. Gomphrena can be impressive massed in beds, but they also adapt well to container culture for season-long color. In cut flower production, gomphrena are grown spaced 6-8″ apart rather than the recommended 12-18″ to force longer stems. They do well as both a fresh cut flower and dried flower. 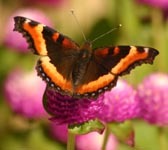 Butterflies are attracted to the flowers. 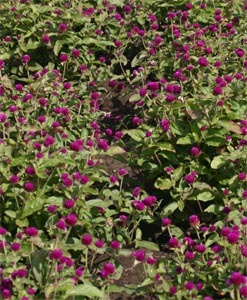 Globe amaranth cultivars are susceptible to powdery mildew, gray mold, and fungal leaf spots during prolonged cool, damp weather, but generally do not have many pest problems. Deer do not prefer this plant, but the flowers are attractive to butterflies. The flowers of this plant make good dried flowers since they retain their shape and color well. Harvest the blooms when they are completely open but not too old or they may fall apart after they are dried. Cut and hang upside down in bunches to dry. They can be used on the stems or removed for craft projects. They are often used in dried arrangements or for potpourri. 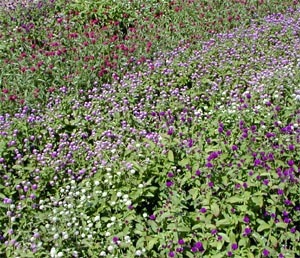 There are many cultivars of gomphrena in a variety of colors. ‘Bicolor Rose’ has pink and white blossoms. ‘Buddy Purple’ is a short variety (8-12″ tall) with intensely purple flowers. ‘Gnome Series’ comes in pink, purple and white and grows only 6″ tall. ‘QIS Series’ offers white, purple, lilac, carmine, rose and red flowers that are especially good as cut flowers. ‘ Strawberry Fields’ (a G. haageana type) produces large, brilliant red flowers on 20″ plants. Gomphrena flowers from summer to frost. The flowers are 11/2-2 inch long clover like blossoms. Gomphrena grows 1-2 feet wide and 1 ft tall. This annual does best in full sun and prefers moist soil, but tolerated dry conditions once established. 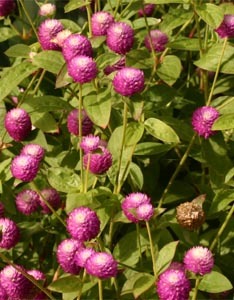 Gomphrena is available in a variety of colors.